I am getting ready to buy a laptop, and I want to run Windows 7. Are netbooks powerful enough to run Win7, or should I go for a larger and more powerful laptop? 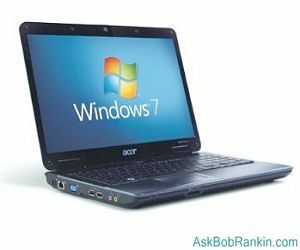 Which Laptops Are Best For Windows 7? The move to Windows 7 is often accomplished by purchasing a laptop. The latest Microsoft operating system is powerful, but it requires a powerful hardware platform in order to show all of its new capabilities to best effect. Here a few tips on buying a laptop that will work well with Windows 7. A 64-bit processor, such as one of the Intel Core 2 Duo models, is a good choice in a new laptop. The 64-bit version of Windows 7 will become the "standard" version in the future, and you may as well be prepared for that. Even now, most 32-bit applications will run much faster on a 64-bit platform, and Windows 7's performance will be maximized. Even the slowest 64-bit CPUs run at 2 Ghz or higher, plenty fast enough for Windows 7. Windows 7 is graphics-intensive, and supports high-definition video playback. To take advantage of the capabilities, and avoid running Windows 7 in less than its highest resolution, get a widescreen display of at least 1280 x 800 resolution, or 720p. The greater the resolution and screen width, the better. A minimum of 2 GB of RAM is needed to run Windows 7 well. 4 GB of RAM is recommended. Gamers will want a third-party high-performance graphics card. Others will do fine with the graphics adapters integrated into modern motherboards. A large hard drive is a must - 250 GB or bigger. Even more importantly, get a 7200 rpm drive instead of the standard 5400 rpm. The 33 per cent increase in read/write speed will be very noticeable under Windows 7, and welcome. Surprisingly, all this powerful hardware doesn't cost very much anymore. It should be easy to put together a more-than-adequate Windows 7 laptop for under $1000. If you shop around you'll find bargains as low as $500 to $600. The HP Probook line of business laptops is priced around $800 and includes all the hardware that normal business users need. It's an "ultraportable" line so the screen is around 12 inches diagonally; but it's light, as little as three pounds, making it ideal for people hurrying through airports and from meeting to meeting. The Acer Aspire line of ultraportables is even cheaper, by about $200. The Aspire looks like a low-end netbook but runs like a full-blown laptop. The Lenovo Thinpad line is famous for its ruggedness, and its weight. But Thinkpads are prized by business people for their reliability and price/performance value. The Sony Vaio line of notebooks have expansive screens, sleek cases, and designer price tags. But under the prettiness is a solid, high-performance notebook that lets Windows 7 really shine. Gamers will pay the premium price for an Alienware M111x notebook. With its high-end hardware, this notebook gives one an edge in real-time fast-paced gaming - at a price approaching $2,000. What About Windows 7 on a Netbook? Netbooks that cost around $300 will run Windows 7, but they are less powerful than their larger laptop cousins. That means less RAM, less CPU horsepower, and less hard drive space. It also may mean a wimpy graphics adapter that won't run the snazzy Aero interface, which makes some of the Windows 7 magic possible. Here's one other drawback to running Windows 7 on a netbook… they usually come with the Windows 7 Starter edition, which lacks some of the features offered in the higher editions of Windows 7. The Windows 7 Starter edition does NOT have the Aero interface, the ability to change your desktop background, multi-monitor support, Windows Media Center, or a DVD playback feature. Most recent comments on "Best Laptops for Windows 7"
I was planning to consult you about this. You see, even though my netbook is Aspire One, Windows7 refuses to even just let me change my desktop wallpaper and worse, it wouldn't install most apps and programs that are certified safe and legit. Help me please? EDITOR'S NOTE: The desktop wallpaper restriction is a limitation of W7 Starter Edition, as I mentioned in my article. What apps won't install, and why? I recently bought a Dell Studio 1555, It has Core 2 Duo 64-bit processor, 4 gigs RAM, it has 1366x786 resolution and a Raedon HD 4570 graphics adapter, it runs smooth and beautifully, also it runs new high intensity games very well. I've had it over a month with no complaints. The best part? less then $900 price tag. In January, I bought a Toshiba Satelite A505-S6981 on sale for $599. It has W7, 64-bit, Core 2 Duo T6600 (2.2GHz), 4 GB DDR3 (faster than DDR2), 400GB HD, 16" display at 1366x786 resolution. I am very happy with it! Just bought a MSI L2300 12.1 netbook W/ win7 Home Premium/AMD Neo MV-40/250gb Sata/2gb DDR2/ 6 cel bat. win7 works great, but am still in learning stage, had XP Pro on desktop. Larger screen, win 7, AMD Neo, and 25ogb in book are a great combo. Fry's had on sale for $379.99, better than big A.
I'm running Windows 7 Home Premium on a MacBook Pro using Parallels 5.0. I also have XP Home Edition SP3 installed on the same machine. What a great setup--XP, 7, and Snow Leopard all on one computer! I have a 2GB ram Core 2 Duo Ubuntu Linux 9.10 Karmic 64-bit distro install with virtualbox a 512MB Nvidia graphics card and a 500 GB hard drive. Can I run Windows 7 in Virtualbox in that setup? Should I get 64 bit Windows and starter edition or what would be the fastest way to run Win7 virtualized on my system? Should I dual boot? The wine software works better when I dual boot and the virtualbox software with XP at least would activate in virtualbox when I had only run it in vbox. I installed in on the hdd and now it won't register in vbox. Can Bob or anyone else help me. I'm a Win7 newbie. I haven't used windows since XP. Thanks. EDITOR'S NOTE: If you want to run both Linux and W7 on the same desktop, then do with a virtual machine install. Otherwise, I would do a dual boot steup. My understanding is that most 32 bit apps (some games are the exception) don't run any faster under 64 bit windows than they do under 32 bit windows. I believe Tom's Hardware is among the sites that did some testing. Another issue is memory. One site I was at tested ddr3 memory in 3, 6, and 12 gigabyte sizes, and found that memory over 3 gigs did not speed anything up in 64 bit windows. That said, I run one desktop with Vista Ultimate 64 bit and 8 gigs of memory, and another with Windows 7 Professional 64 bit and 4 gigs (to be increased to 8 as soon as I can scrape together the dough), and I'm satisfied. I just like the idea that I can run more programs at one time. It may not be faster, but the memory is available. Bob, I got an Asus with Win7 and it runs 64 and 32-bit programs just fine. So far, I like it a lot! Win7 on Netbook: My wife has an Asus netbook with 1GB RAM that came with XP. I have a 2-year old Toshiba Satellite laptop that uses Vista, with Intel Centrino Duo processor, 2GB. Our desktop is a 3-4 yr old HP running XP with 2GB ram & Core 2 Duo chip. I want to get the triple Win7 license and put it on all three (regular Win7 on netbook, not starter version). The netbook will be upgraded to 2GB and the Desktop will get 4GB before I do this. Other than being too cheap to buy a new computer, does anyone see a problem with this? Thanks I decided to stick with WinXP. I have Linux Mint installed on a computer I used to have WinXP on and the retail version installed in Virtualbox. I don't really need windows for anything other than to use on websites (like Netflix's instant streaming site) that don't work with Linux. I think Windows 7 would be to expensive for using only in Vbox or occasional boot in a dual boot system just to go to websites that don't work with Linux. When does the Windows XP support cycle end? Anybody? Thanks. used to work in a repair shop...I used to help the techs tear down laptops and repair them..I think the best made one I've seen is Fujitsu. I especially like the keypad. All of a sudden my win 7 professional stopped me copying files and folders to external devices though I can copy from location to other within the internal hdd. I have tried to get administrative rights in all possible ways but the problem still remains. How can it be resolved.